Anton Friedrich Wilhelm (von) Webern (German: [ˈantɔn ˈveːbɐn]; 3 December 1883 – 15 September 1945) was an Austrian composer and conductor. Along with his mentor Arnold Schoenberg and his colleague Alban Berg, Webern was at the core among those within and more peripheral to the circle of the Second Viennese School, including Ernst Krenek and Theodor W. Adorno. As an exponent of atonality and twelve-tone technique, Webern exerted influence on contemporaries Luigi Dallapiccola, Křenek, and even Schoenberg himself. As a tutor, Webern guided and variously influenced Arnold Elston, Frederick Dorian (Friederich Deutsch), Matty Niël, Fré Focke, Karl Amadeus Hartmann, Philipp Herschkowitz, René Leibowitz, Humphrey Searle, Leopold Spinner, and Stefan Wolpe. Anton Webern’s music was among the most radical of its milieu, both in its concision and in its rigorous and resolute apprehension of twelve-tone technique. His innovations in schematic organization of pitch, rhythm, register, timbre, dynamics, articulation, and melodic contour; his eagerness to redefine imitative contrapuntal techniques such as canon and fugue; and his inclination toward athematicism, abstraction, and lyricism all greatly informed and oriented intra- and post-war European, typically serial or avant-garde composers such as Olivier Messiaen, Pierre Boulez, Karlheinz Stockhausen, Luigi Nono, Bruno Maderna, Henri Pousseur, and György Ligeti. In the United States, meanwhile, his music attracted the interest of Elliott Carter, whose critical ambivalence was marked by a certain enthusiasm nonetheless; Milton Babbitt, who ultimately derived more inspiration from Schoenberg’s twelve-tone practice than that of Webern; and Igor Stravinsky, to whom it was very fruitfully reintroduced by Robert Craft. 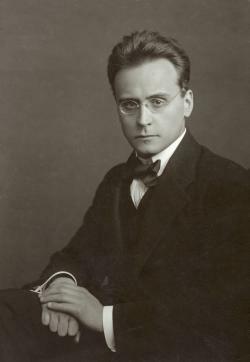 During and shortly after the post-war period, then, Anton Webern was posthumously received with attention first diverted from his sociocultural upbringing and surroundings and, moreover, focused in a direction apparently antithetical to his participation in German Romanticism and Expressionism. A richer understanding of Webern began to emerge in the later half of the 20th century, notably in the work of scholars Kathryn Bailey, Julian Johnson, Felix Meyer, Anne Schreffler, as archivists and biographers (e.g., Hans and Rosaleen Moldenhauer) gained access to sketches, letters, lectures, audio recordings, and other articles of or associated with Webern’s estate.